It's been a busy day in the world of tech news as Google who already has a telecom service in Google Voice has expanded it into Gmail with a two-pronged goal of making it easier to call via Google's network and making the Skype IPO less lucrative. In addition, cloud computing has heated up with Nimbula receiving $15 million dollars so the ex-Amazon founders can purse providing private cloud services. On the TMC front, we officially released TechZone360, our new site dedicated to all things tech and sporting a new and cool interface we hope you love. My readers got an unauthorized sneak peak last week (thanks for not squealing on me) and you can see it has evolved quite a bit these past days. It's been a busy morning with meetings and I literally have 100 items I want to write about and wish I had more time. Its really days like this with the influx of really interesting news that I love my job more than ever. Sure, I can assign articles to my team, but it is always better to comment on them myself - at least the control freak in me thinks so. We have been seeing an incredible stream of registrations for ITEXPO and related events and as is always the case, my team has done its absolute best to make this show better than ever. At TMC we take education extremely seriously and in a trade show market where companies regularly fold up and go away, we are proud to be putting on industry-leading events for 24 years. What I have personally learned over the years is if you provide the best education to your customers with a wide enough array of topics, your attendees walk away very happy. I just came across an article worthy of passing along from the Technology Liberation Front, a group which is focused on helping to reduce the amount of regulation imposed on the Internet and technology. Aside from a typo or two (I make them as swell ) the excellent article titled Amazon.com Switches Sides on Net Neutrality focuses on how tech companies who once supported net neutrality are scared to death of being caught in the crosshairs of an administration gone wild with overregulation. The article begins by discussing how Amazon's Pail Misener has for all practical purposes switched sides on the net neutrality issue as discussed in an editorial for CNET. Some of the points in the post have to do with net neutrality being a solution in need of a problem. Language is obviously crucial to describing and understanding the world around us but did you know the particular language you speak can influence how you see the world as compared to speakers of other languages? This weekend I had a chance to read a fascinating article in the Wall Street Journal on the topic authored by Lera Boroditsky who is a professor of psychology at Stanford University and editor in chief of Frontiers in Cultural Psychology. What makes the article so interesting is the analysis of speakers of different languages and the differences in how they interpret the world. For example, 1/3 of the world uses language with absolute directions for space as opposed to relative ones and as a result the speakers of such languages are able to perform navigational feats scientists once thought humans were incapable of. Many of you in the communications and technology spaces already know Andy Abramson as he is a well-known and influential blogger. But what you may not realize about Andy's company Comunicano is it is a major player in the world of influencer relations. By capitalizing on a strategy which Andy describes as the boulevard of communications, his company works with his clients to ensure their news turns into stories which are told and retold throughout the web and other media outlets. 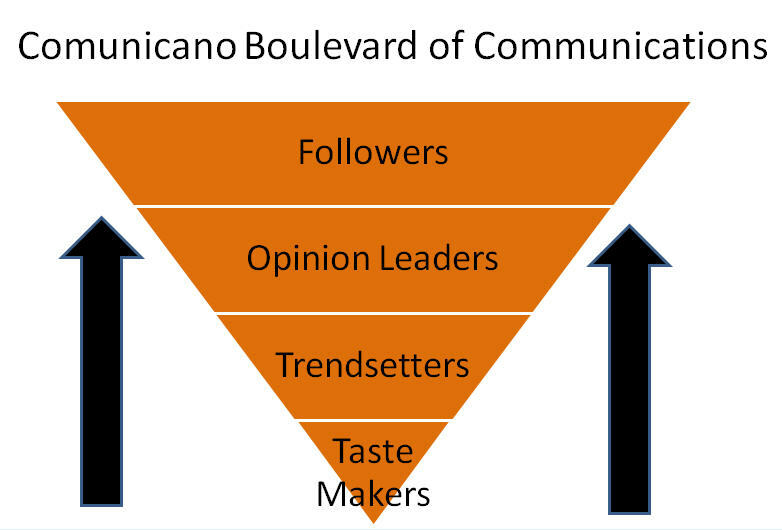 As you can see from the inverted pyramid above, Comunicano segments the disparate audiences necessary to push a product along the influencer road to ultimately convince followers to purchase. Last week I was fortunate enough to head out to San Jose and shoot video interviews with over 100 companies who are the heart and soul of Silicon Valley. For me, it was energizing and refreshing - like consuming vials of energy boosting supplements in rapid succession. In addition, some of my editorial editorial team came with me to meet and greet as well as network with the many companies who make up the various tech markets the TMCnet audience cares about. Gary Kim does a great job explaining in an articlethat Customers will put up with a a lot of imperfection in service quality as evidenced by the 1% churn rate of AT&T versus the industry average of 3%. One wonders however if this staggering low rate isn't just consumers not wanting to give up their iPhones. Kim also mentions Verizon in his post and I agree that the real test comes when the iPhone gets offered on this network - if ever. My experience has shown that around 50% of AT&T users would switch to Verizon based on casual conversations. The impact of so many millions of customers switching carriers would obviously mean the burden of supporting all this wireless data will switch from one carrier to another quite quickly. This brings us back to AT&T who has a limited amount of time to improve it's network before it has to deal with real competition from the Verizon iPhone, Droid X or new Blackberry device said to be yet another iPhone killer.